At this point it looks as if a bucket ladder dredge is required for the project, mining in �steps,� where the deposit is beyond 80 feet in depth. 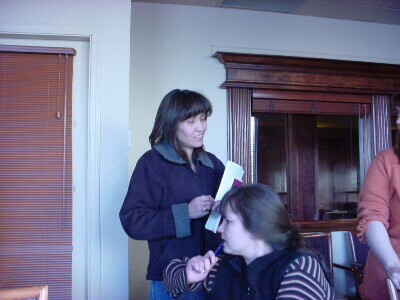 In the Yukon a typical frost free �season� lasts approximately 100 days. With a housed (covered in) bucket ladder dredge, we could potentially have a mining season of between 200 days and 250 days. The onset of extremely cold weather (-40F or colder) is the factor that ultimately determines the end of the mining season. The dredge will process 800 to 1,000 cubic yards of pay-gravels per hour. 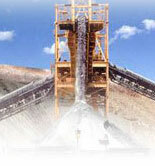 We will operate the dredge 24 hours per day and process pay-gravel approximately 18 hours of each 24 hour period. Conventional testing done on this section of the claims indicates US$10 to $20 gold per cubic yard down to approximately 20 feet from surface. Material from a single 68 foot test hole indicated approximately US$10 gold per cubic yard. For calculation purposes, we will use the value of US$10 gold per cubic yard, bearing in mind that this number projects the results of conventional hand testing and is conservative in light of our recovery abilities. It is possible that the pay-gravels go down to 200 or 300 feet. 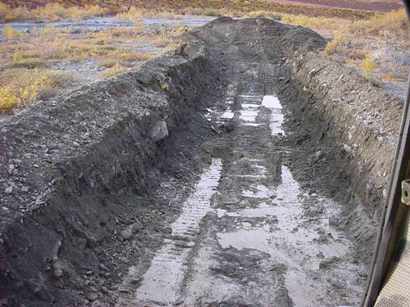 The reason 300 foot pay-gravels are conceivable is because as the Burwash Valley opens up, it ties into the Kluane River Valley. Where the Duke River runs into the Kluane River Valley, approximately 5 miles east of the Burwash, there are significant geological similarities. The bedrock is estimated at a depth of 250 to 300 feet. Only geophysical testing and drilling will tell us whether, in the case of Burwash, the bedrock is at a depth of 70 or 80 feet or deeper. Where we have dug to date, the gravels are 68 feet deep without reaching bedrock, so we will use that figure in our calculations. Using figures of 800 cubic yards per hour, 18 hours per day and US$10 gold recovery per cubic yard processed (using conventional methods), we get a figure of US$144,000 per day. Using this number, a 200 day season yields US$28,000,000 and a 250 days season yields US$36,000,000. Keep in mind that we will be using better than conventional recovery methods which could have recovery rates up to 4 times those projected here. It is possible to get an approximate estimate of the total cubic yardage of this deposit mathematically. The following two estimates were calculated using depth figures of 68 feet and 300 feet respectively and give and indication of the great potential this site has. Using an average width of 1,500 feet for the 750 running feet from the midpoint of Claim 4 through Claim 5 and 2,000 feet in width for the 2500 running feet of the 5 lower claims (Claim 6 to 10), the yield is a total of 15,425,925 cubic yards at 68 feet of depth and a total of 68,055,555 cubic yards at 300 feet of depth. Only exploration and test work will establish a geological proven reserve and the total value of the deposit (similar to the details we have on Fry Pan Creek). This information will determine the equipment we will use and the length of time it will take to mine the deposit. 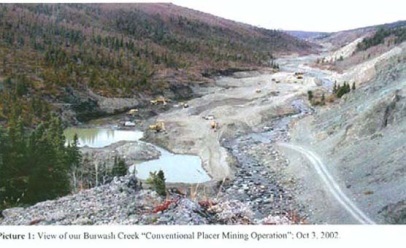 M Quest owns 30 claims at the top end of Burwash Creek where there is evidence of former placer mining activity. During mandatory assessment work some fine gold was recovered by hand panning. This gives an indication that there is gold present, however it will take much more exploration and test work to give a positive determination of any minable reserves. One of the main reasons for acquiring these claims was to allow us to do a total recovery and regeneration of the Burwash Creek watershed. We have purchase agreements for another 40+ claims, which comprise the majority of the remaining claims on Burwash Creek that are not Kluane First Nation lands. The First Nations people of the Burwash area call themselves the Kluane First Nation (KFN) and are the largest population group in the area. KFN is one of the smallest bands in the Yukon with approximately 100 members. They live on the northwest shore of Kluane Lake at Burwash Landing approximately 10 miles from Burwash Creek. KFN is the largest single holder of mineral rights in the area. They have all the mineral rights that surround our claims and the claims for which we have purchase agreements. It is in both of our best interests to work together to mine, reclaim and regenerate the entire Burwash Creek watershed which has seen mining on and off for the past 100 years. 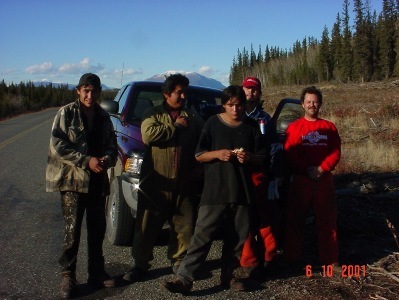 Our mining operators have been working with the KFN for many years. As a result of positive past experiences, we have chosen to work together with the KFN to mine this area. M Quest Capital Corporation and members of KFN have arranged that KFN and their members will be our mining contractor of �first choice.� Any contracting we require will be offered first to KFN and its members to see if they can fulfill the contract. We also intend to institute a job training program for KFN members once we are in full scale production. When we have finished mining and have reclaimed and regenerated the watershed in consultation with KFN, we will relinquish our mining claims and they will revert to KFN ownership.